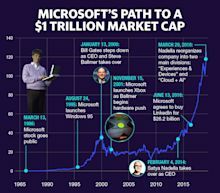 Microsoft hit $1 trillion in market cap for the first time ever after reporting strong earnings results. The 2019 Chevrolet Corvette ZR1 is the ultimate Corvette, and now that Chevy is going the mid-engine route, it will forever be the best traditional front-engine Vette you can buy. If you thought 755 horsepower and 715 pound-feet of torque would be enough to keep Hennessey from wanting more, you're sadly mistaken. The other two are called the HPE850 and HPE1000, with 850 and 1,000 horsepower respectively.